You'll be £19.99 closer to your next £10.00 credit when you purchase From Pole to Pole. What's this? Roald Amundsen (1872-1928) was the most successful polar explorer of his era using sledges, dogs, ski and ships. He is mainly remembered for being the first man to reach the South Pole on 14 December 1911. What is less often remembered is that he was also the first man to reach the North Pole on 12 May 1926 as the leader of the Amundsen- Ellsworth-Nobile expedition in the airship Norge. His involvement in aviation from 1909 to his death in 1928, has not been the subject of a detailed study until now. This book explores Amundsen's enthusiasm for flight from the moment he read about Bleriot's flight across the English Channel in an aeroplane on 25 July 1909. From that moment onwards he saw the potential of aircraft as vehicles to explore portions of the globe that remained unexplored in the first quarter of the 20th century. The man-lifting kites built by Einar Sem-Jacobsen took the life of his second in command, Ole Engelstad and were carried, but not used, during his 1910-1912 expedition to the South Pole. He saw aeroplanes flying in America and Germany in 1913 and in 1914 he was taught to fly by Sem-Jacobsen. He passed his flight test on a Farman Longhorn biplane on 1 June 1914 and in mid-1915 was issued with the Fédération Aéronautique Internationale (Norge) aeroplane pilot's certificate number one. He bought a Farman biplane to take with him on an expedition to the North Polar Sea but the outbreak of the Great War stopped the Expedition and Amundsen gave his Farman to the Norwegian government. After the war he acquired a Curtiss Oriole biplane and two Junkers F13's then in 1925 he embarked on a flight, which he barely survived, to the North Pole in two Dornier Wal flying boats. 1926 brought long delayed success when the Norge flew to the Pole and on to Alaska. On 18 June 1928 he and five companions took off from Tromso on a search and rescue flight for the missing airship Italia and were never seen again. 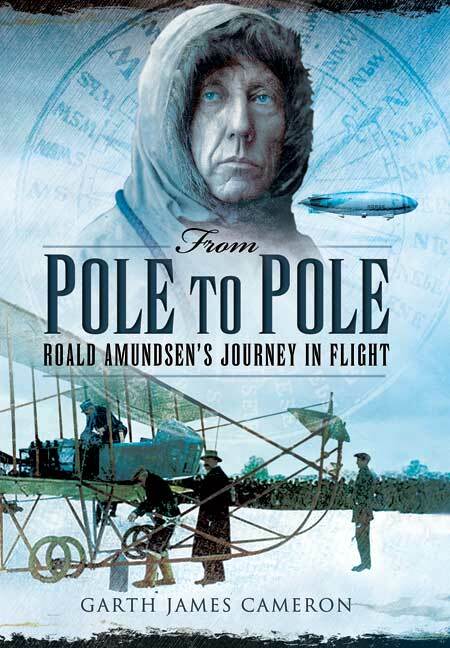 A biographical study of the Norwegian polar explorer Ronald Amundsen and the role that aircraft was to play in his attempts to reach the North Pole, the explorer and five companions losing their own lives on 18 June 1928 in a Latham 47 flying boat while searching for the crew of Umberto Nobile's crashed Italia airship. From Pole to Pole covers a fascinating subject - best read in summer, lest the heating has to be turned up to compensate for the descriptions of arctic cold. Garth James Cameron is a Barrister specialising in aviation law and living in New Zealand. He has been flying since he soloed when he was 16. He has held a Commercial Pilot’s Licence (Aeroplane) and ‘B’ and ‘D’ category flying instructor ratings since 1975 and has logged 3000+ hours as pilot-in-command of a wide variety of aeroplanes. He also holds a Qualified Glider Pilot certificate and a ‘C’ category glider instructors rating. He has sampled parachuting, ballooning and paragliding. He has owned the largest aviation history library in private hands in New Zealand.